The golf course is a themed miniature golf experience and a real adventure. Your playing your way through major parts of Malmö in modern and historical time. 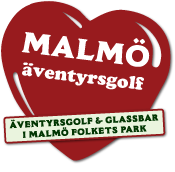 You will get to learn more about Malmös classical landmarks at the same time as you practice and improve your putting skills. And challenges your fellow players. A fun game for younger and older, pros and amateurs and a perfect event on the agenda for a successful corporate day. The course is built to suit all, each hole has at least 2 lanes of play which require different skill levels. The course concept and design is created by a trio consisting of: the creator and storyteller L-G Nilsson, the experienced architect Björn Ollner who has the World as his work place and Hans Olofsson, World Champion in Miniature golf and putting professional. The group has spent lots of time and effort on creating an attraction that welcomes all and rewards all visitors with a highly qualitative and joyful experience, no matter their age.